This is the 29th post in a weekly feature here at Spare Candy, called "In History." Some posts might be little more than a photo, others full on features. If you have any suggestions for a person or event that should be featured, or would like to submit a guest post or cross post, e-mail me at rosiered23 (at) sparecandy (dot) com. 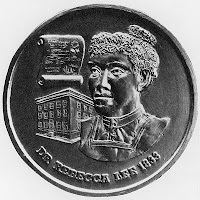 Rebecca Davis Lee Crumpler was the first black woman to become a doctor in the United States. She was born in Delaware in 1831 and later moved to Massachusetts, where she was a nurse. 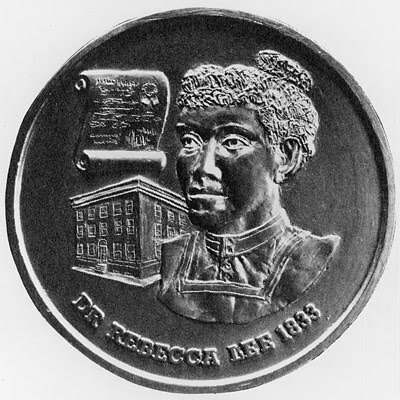 Crumpler graduated from the New England Female Medical College in 1864, the only black woman to ever do so. (For some perspective, the Emancipation Proclamation was issued in 1862-63.) Her degree was actually a "doctress of medicine." Crumpler eventually moved to Virginia, working in communities with large black populations, where she cared for freed slaves. She said of her choice to move to Virginia: "a proper field for real missionary work, and one that would present ample opportunities to become acquainted with the diseases of women and children. During my stay there nearly every hour was improved in that sphere of labor. The last quarter of the year 1866, I was enabled ... to have access each day to a very large number of the indigent, and others of different classes, in a population of over 30,000 colored." Crumpler was involved in the Freedmen's Bureau, and missionary and community groups. In 1883, Crumpler published "A Book of Medical Discourses in Two Parts," one of the first books about medicine by a black author. According to this article, the book "offered women a reference on how to provide medical care for themselves and their children." And according to Wikipedia, "No photos or other images survive of Crumpler, and what little is known of her comes from the introduction to her book." These women are ANGRY! Angry, I say!